If you are facing a Criminal Vehicular Injury or Homicide charge it is crucial that you have an experienced criminal defense attorney with a proven track record in winning criminal cases. 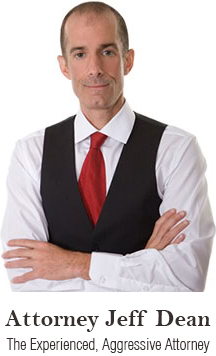 Jeff Dean has that record, and he is known as one of the most respected and successful attorneys in this area of the law. He has won cases ranging from homicide and assault to DWI and drug cases. He has had laws struck down as unconstitutional, won precedent setting cases, and has been featured in the national and local news. In a recent case Jeff’s client was charged with Criminal Vehicular Injury where the client was allegedly drunk and caused an accident with his passenger sustaining serious injuries. After extensive preparation and investigation Jeff successfully got the charges reduced to a mere hit and run. Time and time again Jeff has saved people from going to jail and having a criminal record. Judges have commended Jeff for his success and pursuit of justice, and other attorneys often call upon Jeff for his assistance in the evaluation of their client’s cases. If the offender causes bodily harm to another, he or she may face imprisonment of up to one year and/or a fine of up to $3,000. If the offender causes substantial bodily harm to another, he or she may face imprisonment of up to 3 years and/or a fine of up to $10,000. If the offender causes great bodily harm to another not constituting attempted murder, assault, or great bodily harm to an unborn child who is later born alive, he or she may face up to 5 years imprisonment and/or a fine of up to $10,000. If the offender causes the death of another human not constituting murder, manslaughter, or the death of an unborn child, he or she may face up to 10 years imprisonment and/or a fine of up to $20,000.